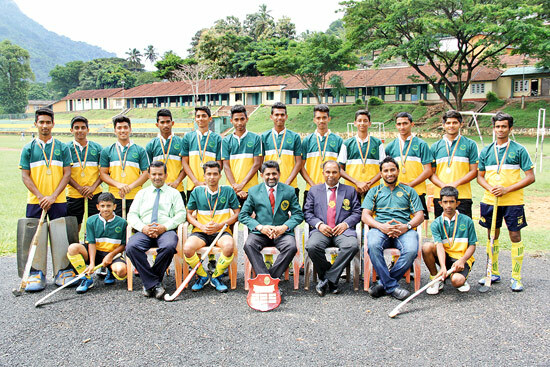 Zahira College, Matale, created a history for themselves this year when they won for the first time the boys hockey championship at the National School Games 2015 organised by the Ministry of Education and played at the Royal College astro turf in Colombo earlier this month. This win by the Matale Zahirians came in as no surprise that last year they finished runner up to Royal College and this year they made certain that they did not end up second best. A peep into the history of the Matale Zahirians that this school was founded in 1948 when the then Member of Parliament for Matale late V.T. Nanayakkara great efforts to donate to them 11 acre block of land in Matale at a village called Taralanda. Perhaps this was after the Muslims had agitated for a Muslim educational institution in Matale. It was a fine gest by V.T. Nanayakkara to have helped the Muslims to reach this goal. The main block of the school took shape through a donation by a philanthropist named Cassim Had Sar. Soon a play ground was constructed and main game was hockey, football, volleyball and another similar to elle but played among the boys themselves with a tennis ball. Former Principal of Zahira College, Matale, and one time national hockey coach A.J.M. Parook told the correspondent that it was George Mant who introduced hockey to Matale and the game prospered over the years. Thus the name of George Mant Live in the hearts of the people of Matale for Making Matale the “Hockey City’ of Sri Lanka. This is something unique to Matale. There was a time the under privileged children who could not afford an hockey stick used curved brunches of trees as improved hockey stick and played the game with a tennis or cork ball at a ground called Coronation ground which has been now converted into a bus stand. Their love for the game was so much. Zahira College, Matale, has produced a very large number of national players and it is difficult to name all of them and one of them is centre half S.I. Ajward who played for the national team for ten years before discarding the hockey stick. Then there was M. Ayub, M Zarook, A.J.M. Parook and many others making the long list. There is no doubt that hockey at Zahira was on the rise. Besides winning a number of other tournaments there the Consolation winners at the 2013 National Schools Games. Then moved up one slot higher to finish as runner up in 2014. Next in 2015 they annexed the championship which had eluded them over the years. This year they won the Central Province under 19 schools champions defeating Christ College, Matale, quite comfortably 3-0 in the finals. At the National School Games finals they beat St. Aloycius College, Galle 2-1 after a close contest. The team was captained b y Abdur Rasman In the finals M. Mohammed Ifras was adjudged the Best Player for his brilliant play both in attack and defence which had a decisive influence in the match. M.M. Waseem who is the Assistant coach moulded the side in the absence of the regular coach helped by Master in charge and Prefect of Games who is also a hockey umpire Mohammed Hanafi.